For other people named Gulab Singh, see Gulab Singh (disambiguation). Maharaja Gulab Singh Jamwal (1792–1857) was the founder of royal Dogra dynasty and first Maharaja of the princely state of Jammu and Kashmir, the second largest princely state in British India, which was created after the defeat of the Sikh Empire in the First Anglo-Sikh War. The Treaty of Amritsar (1846) formalised the sale by the British to Gulab Singh for 7,500,000 Nanakshahee Rupees of all the lands in Kashmir that were ceded to them by the Sikhs by the Treaty of Lahore. Gulab Singh was born on 17 October 1792 in a Dogra Rajput family. His father was Mian Kishore Singh Jamwal. He joined the army of Ranjit Singh in 1809 and was sufficiently successful to be granted a jagir worth 12,000 rupees and also 90 horses. In 1808, following another conflict, Jammu was annexed by Ranjit Singh. Raja Jit Singh, who was expelled, found refuge in British India, and later received in appendage the estate of Akhrota. Ranjit Singh appointed a governor to administer the newly conquered area which was expanded in 1819 with the annexation of Kashmir by a Sikh force. 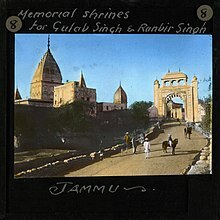 In 1820, in appreciation of services rendered by the family, and by Gulab Singh in particular, Ranjit Singh bestowed the Jammu region as a herary fief upon Kishore Singh. Apart from their sterling services, the family's intimate association with the region commended Kishore Singh's candidature to the Lahore court. In 1821, Gulab Singh captured conquered Rajouri from Aghar Khan and Kishtwar from Raja Tegh Mohammad Singh (alias Saifullah Khan). That same year, Gulab Singh took part in the Sikh conquest of Dera Ghazi Khan. He also captured and executed his own clansman, Mian Dido Jamwal, who had been leading a rebellion against the Sikhs. Kishore Singh died in 1822 and Gulab Singh was confirmed as Raja of Jammu by his suzerain, Ranjit Singh. Shortly afterward, Gulab Singh secured a formal declaration of renunciation from his kinsman, the deposed Raja Jit Singh. As Raja (Governor-General/Chief) of Jammu, Gulab Singh was one of the most powerful chiefs of the Sikh Empire. Under the Imperial and Feudal Army arrangement, he was entitled to keep a personal army of 3 Infantry Regiments, 15 Light Artillery Guns and 40 Garrison Guns. In 1824 Gulab Singh captured the fort of Samartah, near the holy Mansar Lake. In 1827 he accompanied the Sikh Commander-in-Chief Hari Singh Nalwa, who fought and defeated a horde of Afghan rebels led by Sayyid Ahmed at the Battle of Shaidu. Between 1831-39 Ranjit Singh bestowed on Gulab Singh the jagir of the salt mines in northern Punjab, and the nearby Punjabi towns like Bhera, Jhelum, Rohtas, and Gujrat. In 1837, after the death of Hari Singh Nalwa in the Battle of Jamrud, the Muslim tribes of Tanolis, Karrals, Dhunds, Satis and Sudhans rose in revolt in Hazara and Poonch. A local chieftain named Shams Khan led the revolt against the regime and captured several hill forts. Gulab Singh was given the task of crushing the rebellion. After defeating the insurgents in Hazara and Murree hills, Gulab Singh stayed at Kahuta for some time and promoted disunion among the insurgents. Then his forces were sent to crush the insurgents. Eventually, Shams Khan and his Sudhan lieutenants were captured and put to death with some cruelty. The contemporary British commentators state that the local population suffered immensely. On the death of Ranjit Singh in 1839, Lahore became a center of conspiracies and intrigue in which the three Jammu brothers were involved. They succeeded in placing the administration in the hands of Prince Nau Nihal Singh with Raja Dhian Singh as prime minister. However, in 1840, during the funeral procession of his father Maharaja Kharak Singh, Nau Nihal Singh together with Udham Singh, son of Gulab Singh, died when an old brick gate collapsed on them. In January 1841 Sher Singh, son of Ranjit Singh tried to seize the throne of Lahore but was repulsed by the Jammu brothers. The defense of the fort was in the hands of Gulab Singh. After peace was made between the two sides, Gulab Singh and his men were allowed to leave with their weapons. On this occasion, he is said to have taken away a large amount of the Lahore treasure to Jammu. Subsequently, Gulab Singh conquered the fort of Mangla (near the present Mangla Dam on the Jhelum River). Meanwhile, in the continuing intrigues at Lahore, the Sandhawalia Sardars (related to Ranjit Singh) murdered Raja Dhian Singh and the Sikh Maharaja Sher Singh in 1842. Subsequently, Gulab Singh’s youngest brother, Suchet Singh, and nephew, Hira Singh, were also murdered. As the administration collapsed the Khalsa soldiery clamored for the arrears of their pay. In 1844 the Lahore court commanded an invasion of Jammu to extract money from Gulab Singh, reputed to be the richest Raja north of the Sutlej River as he had taken most of the Lahore treasury. However, the Gulab Singh agreed to negotiate on his behalf with the Lahore court. These negotiations imposed an indemnity of 27 lakh Nanakshahee Rupees on the Raja. After the Anglo-Sikh wars, under the Treaty of Lahore the defeated Lahore court was made to transfer Jammu to Gulab Singh. Lacking the resources to occupy such a large region immediately after annexing portions of Punjab, the British recognized Gulab Singh as a Maharaja directly tributary to them on payment of 75 Lakh Nanakshahee Rupees for the war-indemnity (this payment was justified on account of Gulab Singh legally being one of the chiefs of the Kingdom of Lahore and thus responsible for its treaty obligations). The angry courtiers of Lahore (particularly the baptized Sikh, Lal Singh) then incited the governor of Kashmir to rebel against Gulab Singh, but this rebellion was defeated, thanks in great part to the action of Herbert Edwardes, Assistant Resident at Lahore. This arrangement was formalized in the Treaty of Amritsar in 1846. In the second Sikh War of 1849, he allowed his Sikh soldiers to desert and go to fight alongside their brethren in Punjab. The treaties of Chushul and Amritsar had defined the borders of the Kingdom of Jammu in the east, south, and west but the northern border was still undefined. In 1850 the fort of Chilas in the Dard country was conquered. Gilgit was lost to rebellion in 1852 but was recovered ten years later by his son. Maharaja Gulab Singh died on 30 June 1857 and was succeeded by his son, Ranbir Singh. ^ a b c d e K. Jagjit Singh. "GULAB SINGH (1792-1857)". Encyclopaedia of Sikhism. Punjabi University Patiala. Retrieved 6 January 2017. Wikimedia Commons has media related to Gulab Singh of Jammu and Kashmir.